Hopefully it doesn't require much explanation, but I labeled it above as such because not only did the film produce one of the highest grosses openings of all-time, but as the third and final film of this Batman franchise, it also surpassed previous numbers, finishing off with the highest opening weekend totals for any of the three films in the franchise. One thing that I neglected to account for in my weekend predictions was the lack of 3D showing for this film. And by lack, I mean none. Director Christopher Nolan has been very clear about his disinterests with such, and removing the bumped-up ticket prices for 3D showings really accounts for a nice chunk. 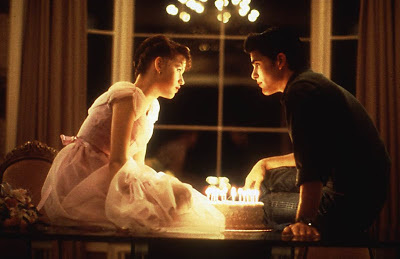 Nonetheless, the film still put together impressive totals and solidified itself as one of the best blockbusters of all-time. 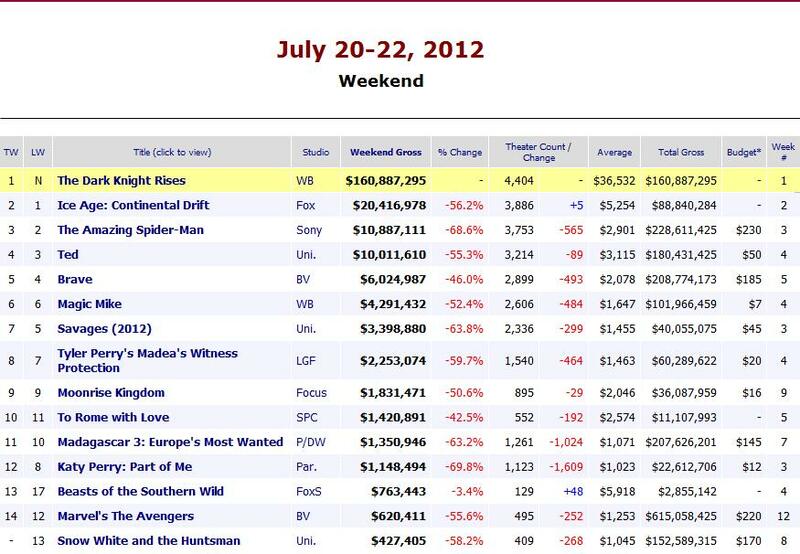 First off, it was nice to see the overall weekend box office numbers back up from a couple of previously slow months. Not too surprisingly, but the weekend numbers topped $200MM for this first time in over two months, the last time being when "The Avengers" hit theaters May 4, 2012. I don't want to rehash the details and our thoughts on the situation too much, but since many are still surely thinking about it (and since our respect for such events postponed this post a day), it's just nice to see that the numbers were so strong regardless of the horrendous situation that unfolded in Colorado Friday morning. When I originally posted about the event, my plea was that regular moviegoers wouldn't let fear stop them, and despite this one vile person, would still continue to show up, unaffected by his madness. That happened this weekend, and I'm glad that this lunatic didn't get the best of all of us. I hope none of that is interpreted incorrectly - I hope it's clear that I mourn the tragedies just as everyone else does, but when I think about the idea of people avoiding doing something that they love because of what one pathetic excuse for a person did, it makes me angry. I feel like showing up and doing what we love spits in this guy's face. And since I can't do that personally, I'll just have to live with this. 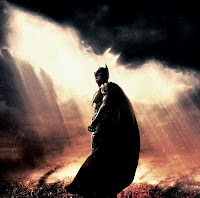 Anyway, as we take a look at the specific numbers this weekend, "The Dark Knight Rises" opened with just over $160MM, accounting for the third-highest opening numbers of all-time, just surpassing its previous installment, "The Dark Knight", which recorded $158MM. The film fell just short of the final Harry Potter installment ($169MM), and ended up well behind what "The Avengers" was able to accomplish a couple of months back ($207MM). What might be the most impressive when looking at that openings list though, is that there are three films that have released this calendar year which currently sit in the Top 5 (and actually, adding one more level, something possibly even more surprising is that the first film of this trilogy, "Batman Begins", isn't even in the top 100, and only opened with a measly $48MM). The total for this weekend is very strong though, especially considering the fact I mentioned before the break, that the film didn't show in 3D at all. We all know that theaters can usually get three-plus dollars more per ticket for such showings, so removing that amount from millions of tickets can add up fast. Many people will want to note that this is the highest weekend opening for any film without 3D screens. It's a very nice accomplishment, but there aren't any real stats for specific breakdowns offering differences between grosses. It's a fun fact though, and something that "The Dark Knight Rises" will surely walk away happy with. Otherwise, unfortunately there isn't a lot to talk about yet, as all of the other opening/superhero records were snatched up by "The Avengers" in May. We'll track the progress of this one and see how it comes along in comparison to both "The Dark Knight" and "The Avengers", but either way, a pretty great showing so far, another great superhero film to add to the mix. We can skim through some of the other films this weekend, but much as was the case when "The Avengers" released, there really just wasn't much else happening this weekend. "Ice Age: Continental Drift", in its second weekend, pulled together $20.4MM, good for a 56% drop - not a number that you usually expect to see from a big studio animated film in its second weekend. The negative reviews and its tiresome act has surely got to most moviegoers who were even considering giving this one a chance. It looked good in theory, but didn't deliver quite the same way many hoped for. "The Amazing Spider-Man" just edged out "Ted" for third place this weekend, with its $10.8MM compared to the $10MM "Ted" put together. Again, percentages are inflated due to the strong showing from "The Dark Knight Rises", but we knew this would be the case. "Ted" is a week older than Spider-Man, so on the surface, it looks bad for Spidey. But if you consider that most of the demographic that would go see Spider-Man probably hit up Batman instead, it seems acceptable. While the "Ted" crowd mixes in with the Dark Knight crowd, it interfered directly with the fan base much less so than Spider-Man probably did. 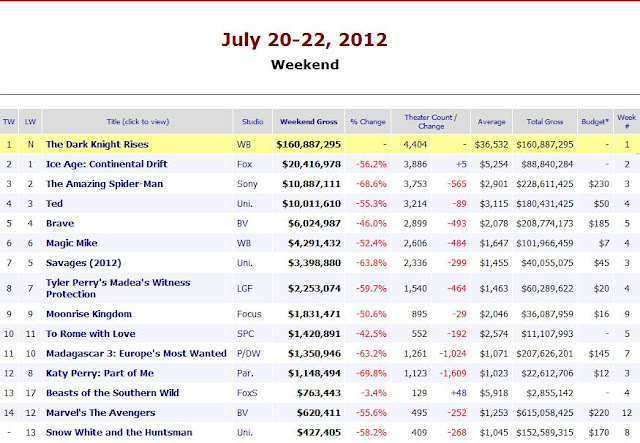 And to be fair, "The Amazing Spider-Man" has now surpassed the $600MM mark worldwide, so it's doing okay. As far as notable benchmarks go, there wasn't much this week. Even though I have yet to see the film, it was nice to see "Magic Mike" cross the $100MM barrier. For a film with only a $7MM budget, those are pretty tough numbers to beat. "Moonrise Kingdom" still in relatively limited release, passed the $35MM mark this weekend, making it already the second-highest grossing Wes Anderson film ever ("The Royal Tenenbaums"). If it continues its strong per theater totals, it has a chance to end up as his best film to-date.